LUG Light Factory able to showcase a new lighting product thanks to MES, Inc.
Fast sourcing turnaround by Euro Metrics Sp. z o.o. allowed a lighting manufacturer, LUG Light Factory Sp. z o.o., to showcase its new lighting product at the 2018 light + building Exhibition in Frankfurt. With operations located in Zelona Góra, Poland, LUG Light Factory was seeking to launch its AVENIDA line of aluminum die cast lighting parts at light + building. 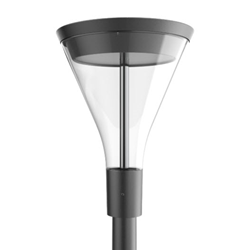 These aluminum parts are used for products lighting a variety of residential and public spaces, including avenues, sidewalks, parks, playgrounds, promenades and residential roadways, among other applications. LUG chose Euro Metrics as the supplier in this project based on the company's global sourcing capabilities and its proven history of short lead times for tool building. Euro Metrics managed to deliver the first AVENIDA samples within 55 days. That allowed LUG to assemble the lighting samples it needed to launch the AVENIDA product line at the Frankfurt show. The AVENIDA presence at the show led directly to several orders. Euro Metrics helped LUG develop multiple faster, more efficient assembly solutions that allowed LUG to accept orders that demanded a fast turnaround and then meet those delivery deadlines. Headquartered in Zielona Góra, Poland, Euro Metrics is a business unity of MES, Inc. It was established to provide supply chain and inventory management services to businesses in Europe. Its parent company, MES, provides logistics and inventory management service to North American customers in the lighting, automotive, electronics, heavy equipment and agriculture industries. If you would like to learn more about the capabilities of Euro Metrics or discuss a specific application or supply chain need, please contact Jakub Danisz via email: jdanisz(at)mesinc.net or via phone: 0048 570 578 737.